God became Man in Bethlehem, right? Nope, it was in Nazareth. By the time Mary arrived in Bethlehem to deliver Jesus he had already been human for nine months. 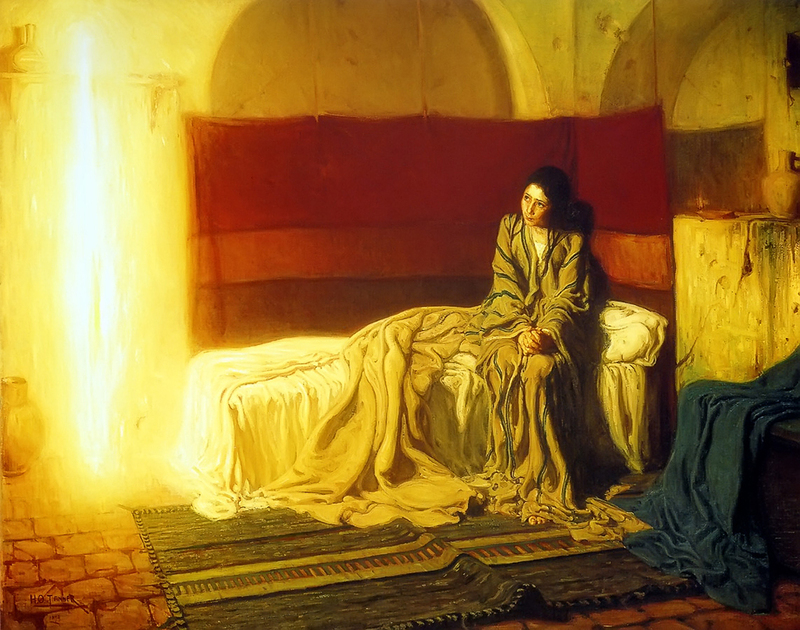 At the Annunciation those first cells in Mary’s womb, to small to see with the human eye (though Elizabeth and John the Baptist recognized Him), were already 100% God and 100% Man – the human person was present in the world. Without the Annunciation there would be no Bethlehem, Cana, Transfiguration or Jerusalem. It was in the humble cave in Nazareth that everything changed and the greatest mystery ever took place. 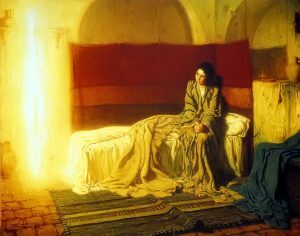 This painting entitled “The Annunciation” was painted in 1898 by Henry Ossawa Tanner and hangs in the Philadelphia Museum of Art. He attempts to show a real girl in her natural setting two thousand years ago. No halo, no religious imagery, no royal trappings. Just the angel represented as light and a wondering girl whose expressive face tells the story as she sits in a modest dwelling. Here she became the Mother of God. Here all time and eternity was altered. “For hold this fast as a firm and settled truth, if you would continue as Catholics, that God the Father begot God the Son without time, and made Him of a Virgin in time. The first nativity exceeds times; the second nativity enlightens times. Yet both nativities are marvelous; the one without a mother, the other without a father. When God begot the Son, He begot Him of Himself, not of a mother; when the Mother gave birth to her Son, she gave Him birth as a Virgin, not by man. He was born of the Father without a beginning; He was born of a mother, as today at an appointed beginning. Born of the Father He made us; born of a mother He re-made us. He was born of the Father, that we might be; He was born of a mother, that we might not be lost.” St. Augustine, Sermon 90. Previous post: Jesus Said His Mother Had Other Sons! Really? Next post: Security in Israel: Safe to Travel with Steve & Janet?